Netflix has set an official release date for Trailer Park Boys: The Animated Series on March 31, and an official trailer has also been released to give fans an early look at the show. Continuing the adventures of Bubbles, Ricky, and Julian, these new episodes follow the events of Season 12 for the long-running series, which ended with the characters turning into cartoon characters. Now, it seems their foray into animation is just days away from arriving on Netflix, and it's needless to say fans of the series are incredibly excited to know that the boys are back. The new trailer features lead actors Mike Smith, Robb Wells, and John Paul Tremblay reprising the roles of Bubbles, Ricky, and Julian. Self-aware of their new animated form, the characters are at first baffled, but choose to make the best of the new cartoon world they live in. Unfortunately, they quickly learn the hard way that real world rules still apply to them, and that pain and injuries are still very real. The trailer also reveals that Mr. Lahey is still a part of the show, although it's unclear who's voicing the character. Production on the main series had been halted following the death of Mr. Lahey actor John Dunsworth, with the live-action future of the show still uncertain. Trailer Park Boys was originally created by Mike Clattenburg as a mockumentary series set in a Canadian trailer park. Based on Clattenburg's 1999 movie of the same name, the show first premiered on Showcase in 2001. The series grew so successful it spawned a trilogy of movies, and began premiering new seasons on Netflix beginning with Season 8. Netflix also labels the new trailer for the animated show as Season 1, meaning additional seasons of the cartoon version are likely to be produced as well. Bringing Trailer Park Boys to Netflix has proven to be a wise decision for the company. The show has built a tremendous audience on the streaming service, with many late bloomers still finding and binging the series for the first time. In addition to bringing the TV series to the service, Netflix has also used the cast for the spin-off Trailer Park Boys: Out of the Park. The first season had all three lead cast members visiting various locations in Europe, with Season 2 focusing on their adventures south of the Canadian border in the United States. There's just a certain charm to these characters that makes the franchise addictive to watch, and it's exciting to see that they'll be back on Netflix sooner than we thought. It's a good time to be a Trailer Park Boys fan. The official cruise just hit the shore last week, transporting diehard fans of the show to the bahamas and back with the titular crew on board. Next, they'll be getting new material with the animated series set to hit Netflix later this month. 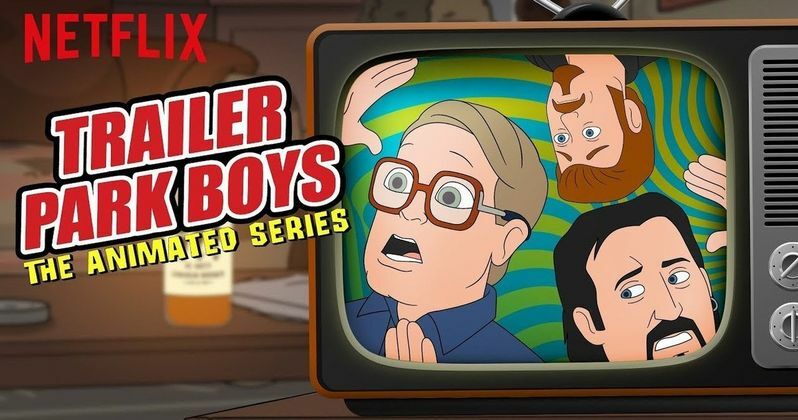 Watch Trailer Park Boys: The Animated Series on March 31, and check out the official trailer below direct from Netflix Streaming Youtube.